Yes, 1933 was, I believe, the absolute lowest-production year for the Hudson company. If you're having trouble finding 1933 Terraplane parts, just consider the plight of 1933 Hudson owners. Only about 20 of these cars remain. 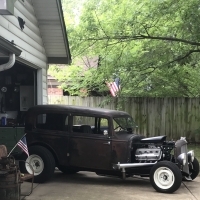 And every time one gets street rodded, it makes the remaining "stock" 1933's all the rarer, rewarding those who didn't get frustrated, and persevered to either find the parts, or actually fabricate them. Quote "I'm totally convinced the there is no available aftermarket or used parts out there for 33s"
Not too many surprises there. Try looking for parts for a 1933 Graham. By comparison Hudsons are plentiful. 1933 was likely the lowest production year for any US make. I still believe there are some parts out there that some guys have and won't let go. I'll have to agree with Jon B to a point but some parts are impossible to fab. The street rod side turns my stomach but a traditional hot rod gets my blood going. Here's my other 33. Have a 33 Hudson. I'm finding that many 32 parts mechanically, and some other parts such as lights, etc interchange with 1932 which is somewhat more plentiful. But 33 Terraplane parts seem to be available in abundance compared to 33 Hudson, as Jon stated above. Unfortunately, there really aren't many, if any, interchangeable parts with 32 Essex Terraplane as far as I'm aware, but it's worth looking at that. I'm not actively restoring my car yet, but just gathering parts. Have a ways to go yet. As somebody recommended to me here previously; don't forget to look at the hot rod forums and to talk to the hot rod guys - they are likely to be your best source for parts. Using 33kc1989's hot rod photo as an example - if that were the finished form of some guy's 33 Terraplane hot rod, that guy might be a source for fenders, hood, running boards etc., especially if the he was not a HET enthusiast. Parts for the more plentiful 34s are not easy to find either. Even something as nonspecific as the 16" wheels (optional for 34 Terraplane K to use the 16/6 tires) ...could only come up with a source for 2. It seems like 30 or 40 years ago every WTN article about a local meet had a 34 coupe pictured - don't see them anymore. I recently got a couple 34/35 engine blocks by going the hot-rodder route. just found a Essex terraplane 8 metal emblem. Looks like it was part of the hood ornament. 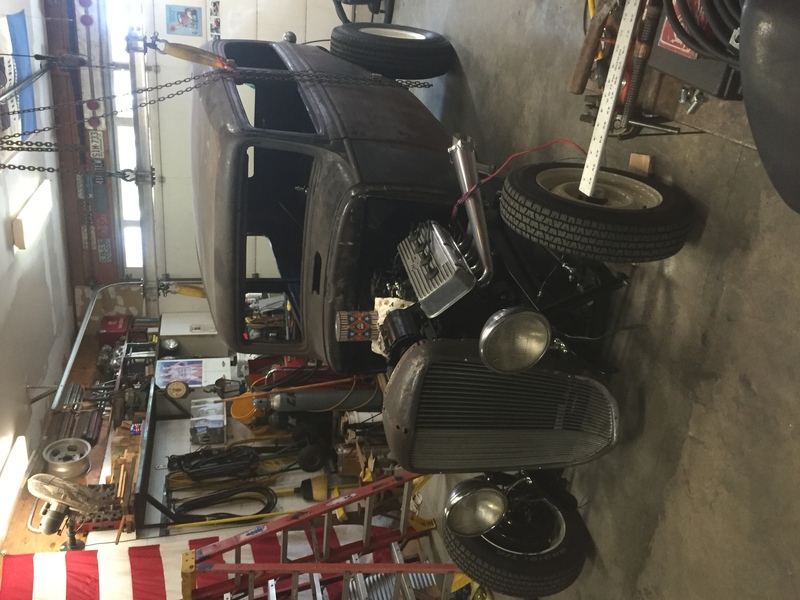 Picture of Hot Rod is with a 1932 grill, no crank hole, so no cover fits. Shell looks like '32 too. Your right Hans it is a 32 grill. Shell is a 33. I have made some '33 parts. What are you looking for? 33kc1989 where are you located? I’m in the market for lower portion of door, lower part of cowl. In other words lower portion of body even though it’s not totally gone. Just easier to replace.